GREETINGS FROM MANCHESTER CITY CENTRE, where it's a bright, hot and sunny July weekend. WHERE IS MANCHESTER and how many people live there? FIRST KEY FACT: The conurbation of Manchester is much much bigger than the place referred to in the encyclopaedia, namely the City of Manchester. The City of Manchester, as seen in the map, is a long, narrow area, shaped like a piece of fried fish, squeezed in between neighbouring districts to the east and west. 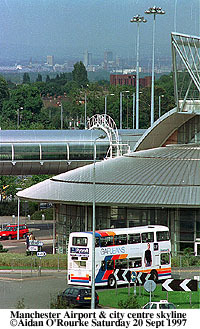 It stretches from Heaton Park in the north, through the city centre to Manchester Airport in the south. It's approximately 15 miles (22.5 km) long by 5 miles (8km) wide, and is governed from Manchester Town Hall (above right), in Albert Square. The population of this area is around 454,700. 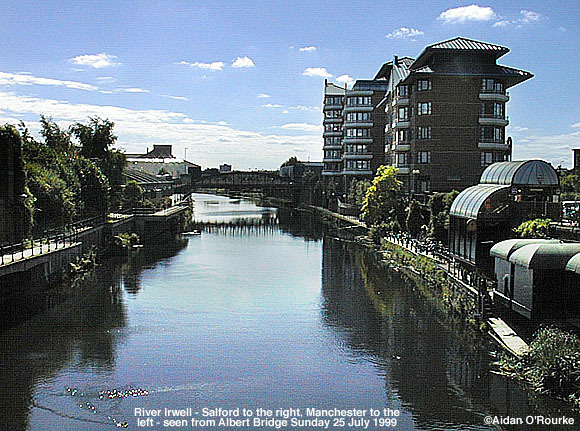 Five minutes walk from the Town Hall is the River Irwell (above), and that's where Manchester ends, and another city starts - the City of Salford, where you'll find the former Manchester Docks, now Salford Quays, and the Royal Manchester Children's Hospital. 15 minutes walk south west from the Town Hall and you're in the Borough of Trafford, home of Manchester's most famous export, Manchester United. Go east, and soon you'll leave Manchester and cross into Tameside, where you'll find the interestingly named "Museum of the Manchesters". - Confusing isn't it? MANCHESTER, THE CONURBATION, is divided up into separate districts, and these districts are also, to a greater or lesser extent, Manchester. Other cities are divided up into districts - New York has 5 boroughs, and sometimes we confuse Manhattan with New York. But New York has a mayor and a single authority covering all five boroughs. London, i.e. Greater London, consists of 32 local authorities, including the tiny but influential City of London. In 1999 London doesn't have a mayor and single authority, but soon, it will. Manchester, i.e. Greater Manchester, doesn't have a single authority or mayor at present, but in the near future, who knows? MANCHESTER IS UNDER-RATED AND MISREPRESENTED because it's divided among separate districts with separate and sometimes competing local authorities. So why is the city of Manchester so small and why didn't it expand to take in surrounding areas? Manchester and the cotton towns around it became rich and powerful in the 19th century. This was the age of the municipal pride and power - the industrial towns to the north, west and east clung onto their own independence and refused to be taken over by Manchester. Manchester - the City of Manchester - could only expand south across the River Mersey into the countryside of Cheshire. That's why the City of Manchester, to this day, is long and thin, and why Manchester Airport, though situated 12 miles south of the city centre on what used to be the lush, green fields of Cheshire, is located within the boundaries of the City of Manchester. 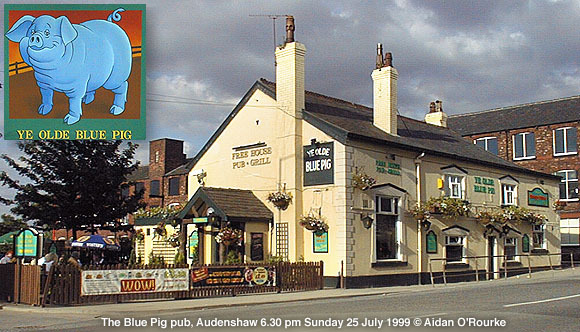 IN 1974 THERE WAS AN ATTEMPT to create something bigger and better out of the diverse patchwork of urban and rural areas in and around Manchester. Old county boundaries (see 1840 map) were redrawn, and previously independent cities, towns and villages were organised into larger metropolitan districts which, alongside the City of Manchester, came together to form the county of Greater Manchester, governed from a brand new building - County Hall - in Manchester city centre. 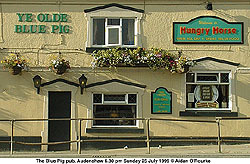 In other parts of the UK, metropolitan districts such as Merseyside and Tyneside were created at the same time. This was an extra level of local government - with special responsibility for things like public transport, police, waste disposal and economic development. The individual councils continued to be responsible for matters including education, libraries, waste collection, social services, government housing and others. 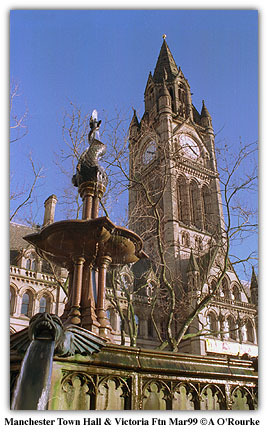 IN 1986, MARGARET THATCHER AND THE CONSERVATIVE GOVERNMENT abolished the metropolitan councils, including Greater Manchester. She regarded them as wasteful and unnecessary, and disliked their left-wing Labour character, particularly the Greater London Council, and its leader "Red" Ken Livingstone. Since then, Greater Manchester, London and other great conurbations around the UK have each run their affairs without a single overriding authority. But Greater Manchester lives on in the form of the Greater Manchester Police force, joint boards to co-ordinate waste disposal, rivers and other matters, and the "Greater Manchester County" signs you can still see on the M62. IN 1999 POWER IS BEING HANDED BACK DOWN to local districts - in Tameside and Trafford, local area councils are being created. Elswhere, power is being transferred up to new regional authorities: London will soon have its Greater London Authority and Mayor. And Manchester? Discussions continue, and I'll report on any new developments here. 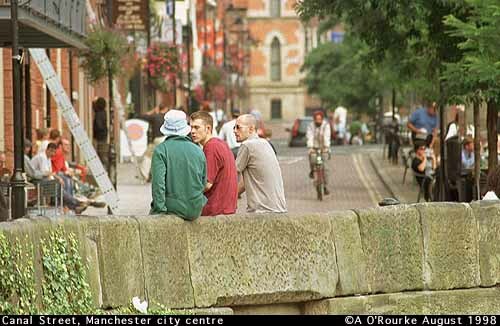 WHAT'S CERTAIN is that Manchester is more, much more than just the City of Manchester. The current city limits serve only to divide and reduce economic and other opportunities. For instance, the City of Manchester has to bear the bulk of the costs of the 2002 Commonwealth Games, even though the whole conurbation, (and indeed the whole of the UK) will benefit. 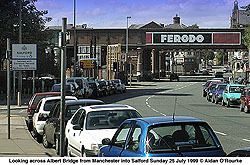 The Manchester area is developing a reputation as a place of economic success, and yet if a potential investor in Japan or the Middle East looks in a directory, Ashton, Bury, Salford, Stretford, Trafford and other local areas appear not to be part of this place, and are scattered up and down the A-Z listing. 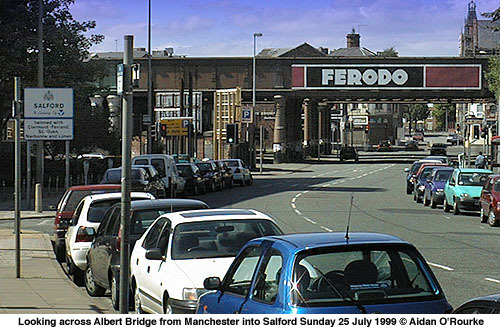 Addresses using the old county boundaries, such as "Salford, Lancashire" and "Sale, Cheshire" confuse matters further. Manchester is expanded to include adjacent districts of neighbouring boroughs. This would make a city of 1.2m, but neighbouring councils are not keen on the idea as they would lose some of their territory. The 10 districts come together to form a "City of Greater Manchester" - with 2.3m people, this would be a vast area and population for one council to govern. 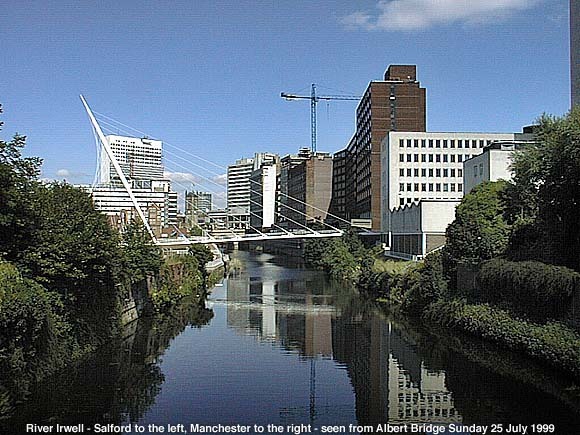 The City of Manchester and City of Salford are merged to form "Salchester" - an idea flawed by the silly name and the fact other important parts of the conurbation are still excluded. Power should be passed down to independent councils serving local communities (this is already happening). The existing 10 districts continue in an overseeing role. The old county boundaries of Lancashire and Cheshire are revived as important historical and geographical artefacts, with signs to mark where they run. WHAT'S IN A NAME? An awful lot: Manchester is turning into a marketable brand. Eyewitness says: It could be officially recognised that Manchester - the name - refers to the conurbation, not just the city. So if an individual or a company, wants to use Manchester in their address, they can do. E.g. Salford Quays Manchester or Cheadle Manchester, or Middleton, Manchester - many do this already. They can still use the county or local town if they want to - Salford Quays, Lancashire, Cheadle, Stockport or Cheadle Cheshire - Ultimately, it's the postcode that matters. "Manchester is a conurbation in the north west of England with a population of over two and a half million people living within 12 miles (20km) of the city centre. In size and importance, it's second only to London, which is situated 183 miles (300 km) to the south west." 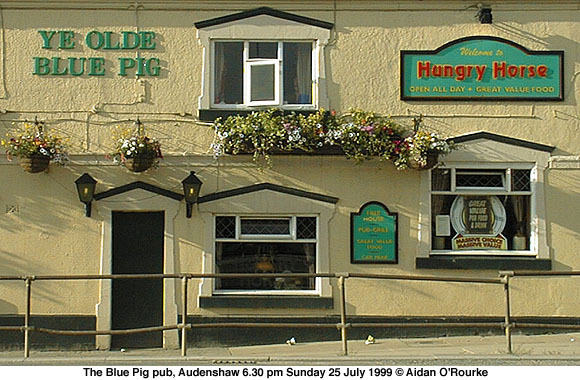 IN JULY 1978, 21 years ago the world's first "test tube baby" was brought into the world at Oldham Royal Hospital. She now lives in Bristol and is reported to hate the term "test tube baby". The medical name is "in vitro fertilisation" - fertilisation in glass. It was a great achievement - since then, over a third of a million people worldwide owe their existence to IVF. Salford and Trafford health authority has unfortunatly had to discontinue the procedure due to cost factors. So if you've got bugs in your reproductive operating system, choose your local authority carefully! More health info - and my photos - on the Manchester Health Authority website. IN THE CURRENT HOT WEATHER it would be nice to go to the swimming baths and cool down. Today I passed Gorton Tub swimming complex, also known as Neptune's World, and was horrified to find it completely closed up and deserted. The reason: an arson attack on the roof. It was a superb attraction equalling many at seaside resorts. The mindless thugs who caused the damage ought to receive a punishment far more severe than the current judicial system will give them. Crime and vandalism are, I'm sorry to say, a major problem in many parts of Manchester, and I wish I knew what the solution was. MARKETING MANCHESTER, the state funded body set up to promote Manchester around the world, has come up with a new campaign. They are to sell Manchester as the "a gay capital", targeting affluent gay and lesbian travellers from around the world. Not surprisingly, the campaign is arousing controversy: Manchester Civic Society chairman Anthony Wilson (no relation to Tony Wilson of Factory Records) described the campaign as "high risk", warning against the "trivialisation" of the city's image. And in an MEN reader poll 9 out of 10 respondents said they were against it. But many people on the street probably think it's a good idea, as it should bring lots of visitors, hence money, to the city. I'm sure there'll be a positive response in San Francisco and Sydney, but what about Salt Lake City and Saudi Arabia? Maybe there will be one or two people who'll think, when they see "Manchester, gay capital of the UK", that Manchester has rightly taken over from London as the UK's capital city, and that everyone here is feeling rather jolly about it! ATTENTION, CALLING ALL CAR DRIVERS! 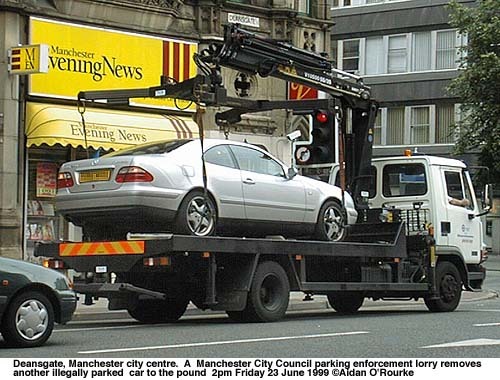 If you're in Manchester city centre and park on a double yellow line or overstay on your parking meter by two nanoseconds, Manchester Parking will come and take it away for you! This saves you the trouble of driving it away yourself. Then all you have to do is go down to the car pound and pay a hefty fee to get it back. What a great way to spend a shopping trip or working day! 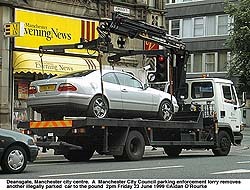 This service is provided for you by Manchester City Council. Yes, every day I'm in the centre, I'm guaranteed to see one of those Manchester Parking lorries carting off some unfortunate car driver's set of wheels, which he or she unwisely left parked in the wrong place. A friend of mine thinks this is stealing, and bitterly resents the work of the new parking patrols, with their dark coloured "jobsworth" uniforms and computerised handsets. He works in the city centre, and often travels in by train, but on some days he has to bring the car, and his employer can't offer company parking. Eyewitness in Manchester parking tips: Try the Arndale car park, entrance on High St, off Market St. Also the one under the Ramada Hotel, off Deansgate - In both of these multi-storey car parks, it's only £1 for 2 hours, £2 for three hours and so on. And the one big advantage - your car is there when you get back! ATTRACTIONS this weekend have included the Watersedge pop festival in Castlefield, and the Royal Horticultural Society flower show at Tatton Park. It's been a mostly warm and sun-drenched weekend in Manchester, so none of that talk about the British weather, please!